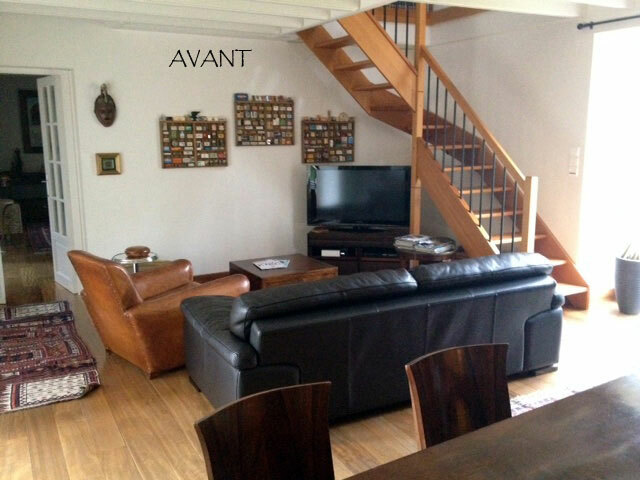 Sent in from users of StairDesigner and our StairFile and other services. Please get in touch if you would like us to feature your work here or if you would like us to create an article about your experience. "The horizontal laminates have saved us a lot of time and hard work. 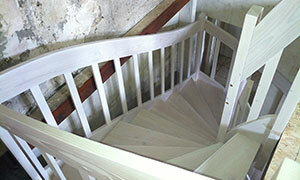 We have been able to produce a stair faster and with a cleaner result than using traditional laminated techniques. 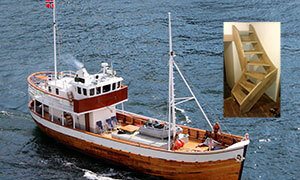 So a big thanks to Ness and the team at Wood Designer for sharing their know-how so generously." 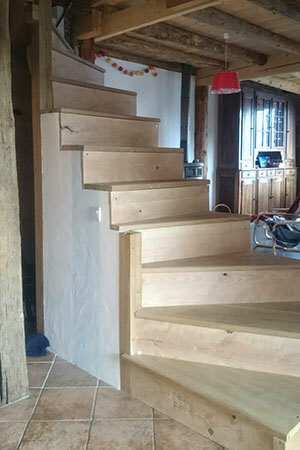 Jérémie has sent us a short video of his stair that really shows off his craftsmanship and how with a little help from StairDesigner and our StairFile service it’s possible to put together some very good projects. "I have just built this cement stair using a full scale drawing on 5mm ply and your StairDesigner software for setting out the steps and forms... 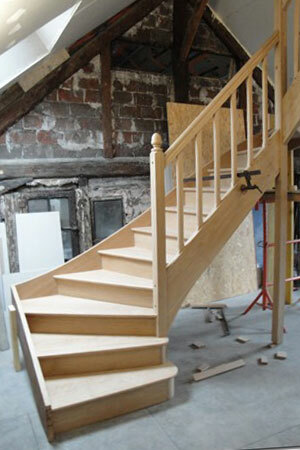 Thanks for your website and the original and professional way you present stair building." 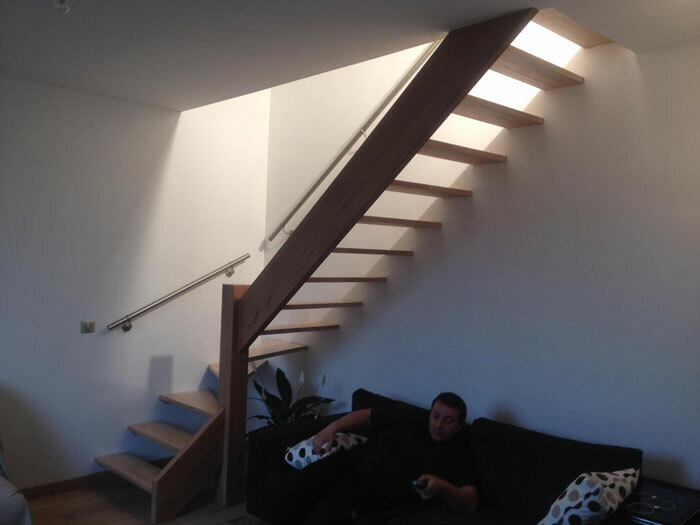 "For several years we've used Wood Designer’s StairFile service to build stair projects using the StairDesigner plans and invaluable coaching for the design and build. 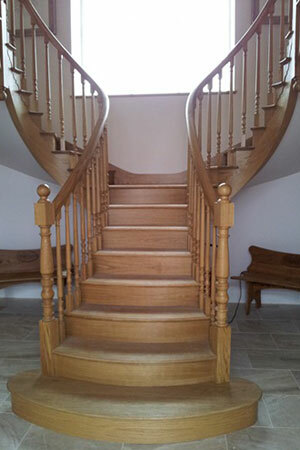 Here’s a stair we recently built in oak. 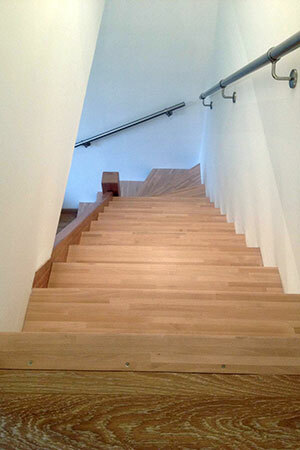 The steps are held using custom steel brackets buried in the wall." 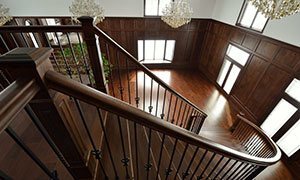 "The stairway is a commercial job that was originally supposed to be covered with tile of some sorts, the owner decided that he wanted something different and decided that he wanted hardwood with a glass banister... This is how it turned out." 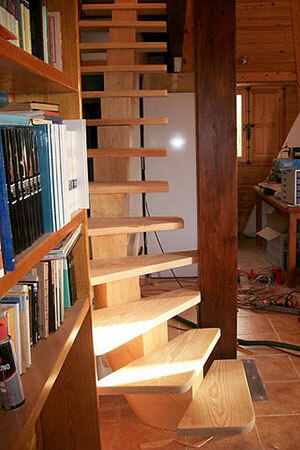 "I'm writing to you almost a year since I began working with StairDesigner. 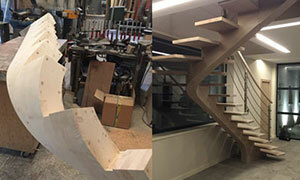 The software has allowed me to expand into stair manufacture by removing all the complicated steps you often have to deal with in a smaller workshop. Calculations are also very easy. Here are some pictures of the first staircase I made with StairDesigner." 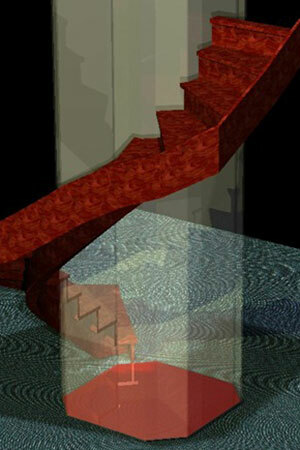 "Hi, I'm enjoying StairDesigner, great tool, not only for manufacturing but also for sales. 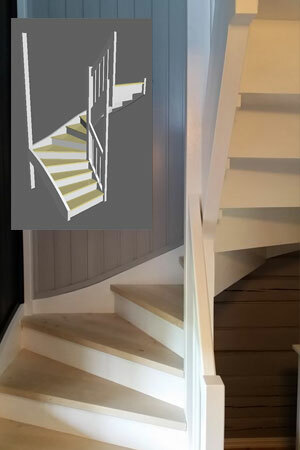 Customers like it very much when they can get 3D pictures of their stairs instantly right there on site after I've measured the stairwell, and they can see different options and styles. Best regards! God bless!" 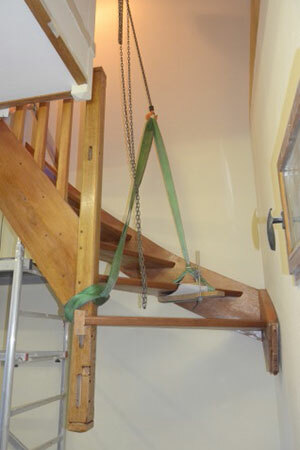 "The stair is now assembled in my workshop, and I’m really happy with the result. Thanks for your precious advice that has been very helpful. The plans in DXF and the ordinate dimensioning has been a real life saver." 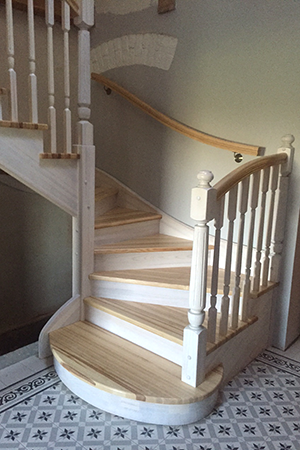 "I’ve learned a lot thanks to you and StairDesigner and building a quarter turn stair with winders is an ambitious project for an amateur wood worker like myself. 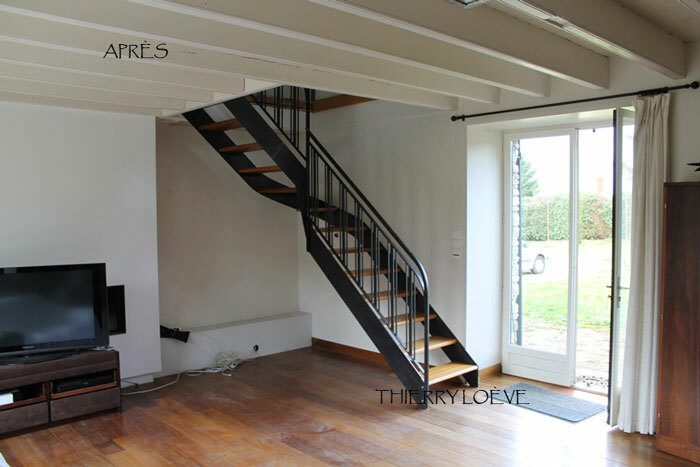 Your advice and coaching to set up the plans and all through the build of this project made it a complete success!" 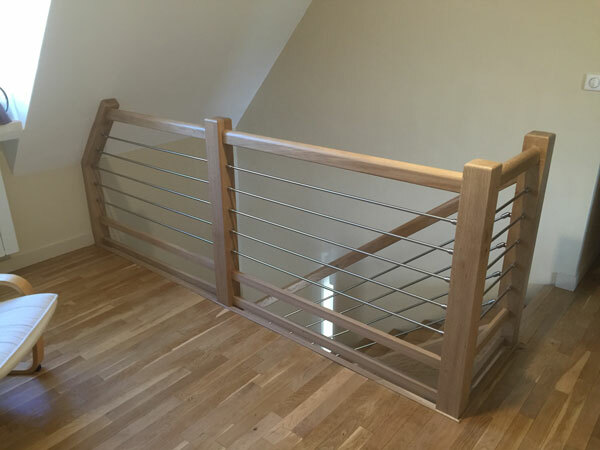 "What really impressed me was that Ness not only offers software and services to help build stairs, but he’s also an amazing resource for advice and support, sharing the secrets of the trade that I couldn’t find anywhere else." 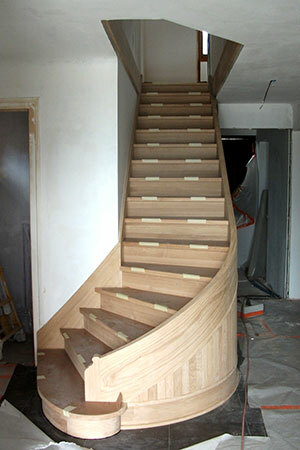 "Installation of my first stair right now... Thanks for all the help Ness." 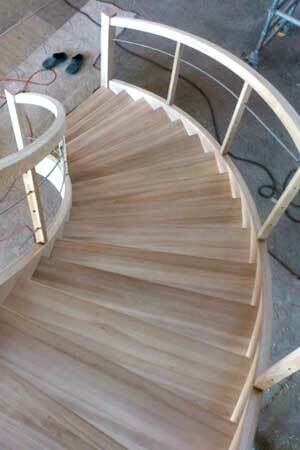 I wanted to thank you for all the help that you have kindly offered me throughout my stair project. Despite my many years experience in woodworking, your expert advice helped greatly with the calculations. Your product and your support are excellent. I must admit, I use the free version of StairDesigner and I am in my seventh staircase. I still have two to go. I am neither a mason nor a carpenter, I am an accountant. Even your free software is very useful. "I have cut and assembled the stair. Last thing I did before we took off for vacation... Here the stair was a success." 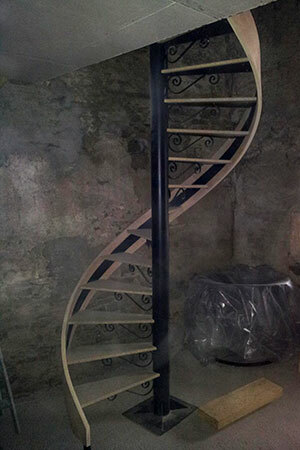 "A few photos of the stair I have been able to make thanks to StairDesigner and your help and support... the shape was very complicated... the stair is in cement and I made the form in wood. 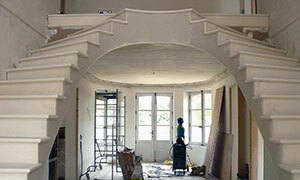 I employed a stone mason to cover the stair in marble and plastered the underside." 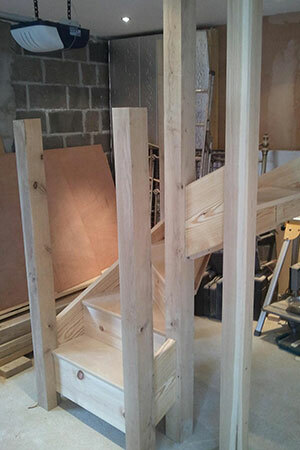 "Your motivation and enthusiasm helped me dare undertake the challenge of stair building. I not afraid of much but a stair seemed daunting for someone who has never made one before! And here it is my first stair has been installed for about a year and I’m pretty proud of it! 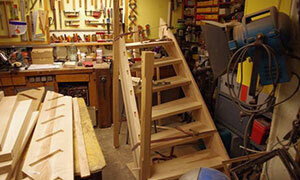 And now I’m starting another stair project for my daughter." "Thanks again for taking the time to advise me. 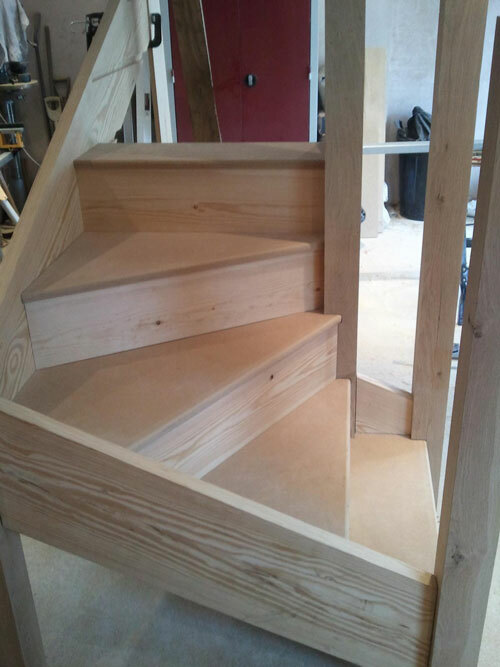 "Following the advice received from you through the forum as a free subscriber, I got down to the manufacture of a range of stairs, here's one. I didn't have any training but I managed after I discovered your site on the internet, which made me want to continue in this area. 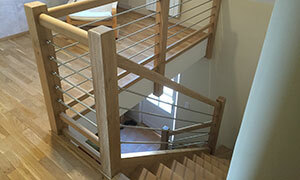 I am very happy with the StairDesigner software which I find very easy to use." "Thanks for your help and advice. Since I started my company three years ago, your techniques and advice have continue to help and inspire my work." "So with the help of Ness and the software which to be fair I didn’t have time to learn we designed and produced by hand...in under 10 days from start to finish. It's a big thumbs up from us to the power of the software, the internet and this group." 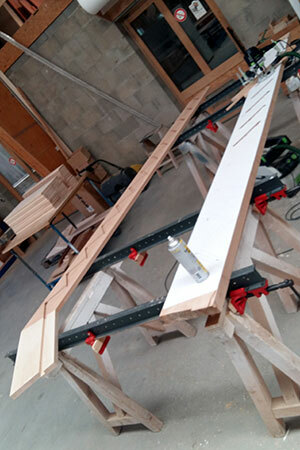 "Not a carpenter, and never built stairs before in my life, so a double winder is a bit of a challenge, still about half way now, and very pleased so far... many thanks for your help!" 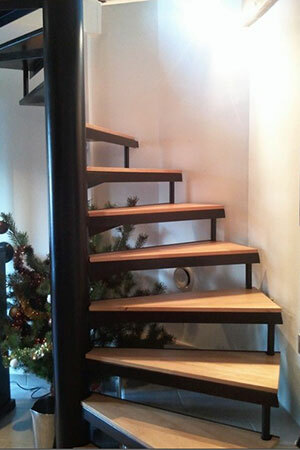 "After having worked hard on my stair project it's at last finished and installed. I haven't had any problems building the stair nor getting the winders to fit on the turning...thanks to your services and advice..Thanks again for all your help a real God send that saved me hours of work and struggling"
"I would like to thank you once again for the advice and personal coaching that you have given me over the last few weeks since I’ve started work on my house and especially the stair that I have built thanks to your StairDesigner software." 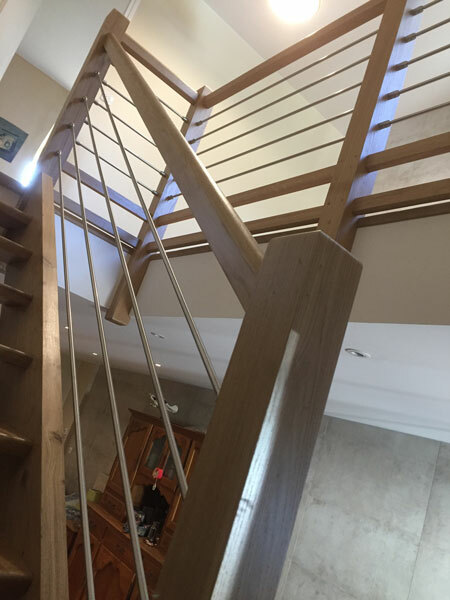 "I would humbly give the following advice...use Wood Designer’s StairFile service, it will save you hours of calculations and possibly expensive errors." Just thought I would give you an update, it was a long while ago you helped me out with my stair design on your software, but finally getting around to making them. Not a carpenter, and never built stairs before in my life, so a double winder is a bit of a challenge, still about half way now, and very pleased so far, I will route out below the treads before final assembly and wedge from behind. But everything at the moment is dry assembled in my garage, ready to come apart and go in the house. 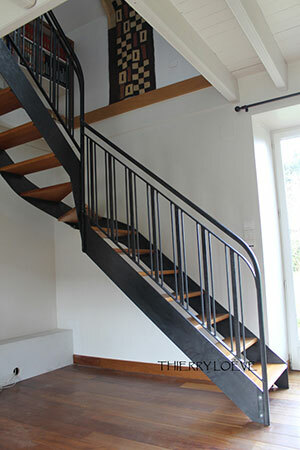 After quite a bit of testing and tweaking my ArtDeco stair project is at last installed. I didin't have any problems installing the winders so that was a great result. 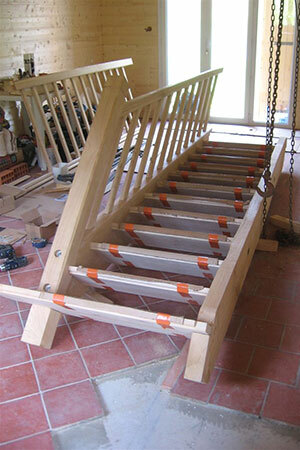 We have been able to make one of the new steps using wood from the stringers that we replaced with metal. 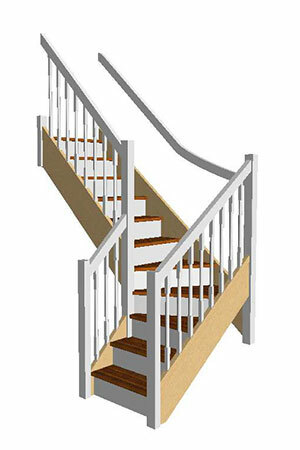 "I would like to thank you once again for the advice and personal coaching that you have given me over the last few weeks since I’ve started work on my house and especially the stair that I have built thanks to your StairDesigner software. Here are a few photos of the finished stairs that worked out much better than I could have hoped for (we are just amateur DIY enthusiasts), but we are proud to have made our stairs and proud of the final product! 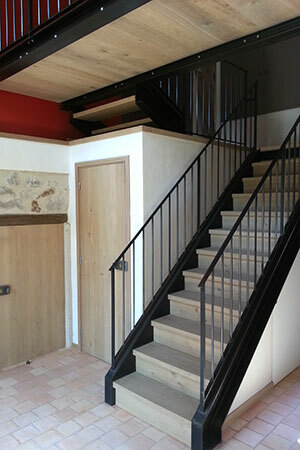 We wish you all the best for your future project and now, for us it’s time to rest a bit and enjoy our new stairs. "I’d like to thank you for all the help and advice you have given on your site and emails. With help of your documentation and tutorials, I quickly and easily got the hang of using the demo version of StairDesigner, and designed a stair that fitted my project. I worked part time at my own pace, for 2 months (I’m retired so I do have some free time) and machined up the parts. Yesterday I went to install and everything fell into place perfectly, just like the drawn model. Use StairDesigner to design your project. 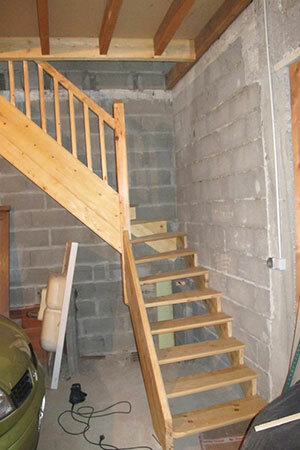 It’s easy to use and covers most of the different types of stairs that might want to build. If you don’t have a good understanding of geometry and maths, and can’t use some sort of CAD software don’t try to draw up the plans by yourself. 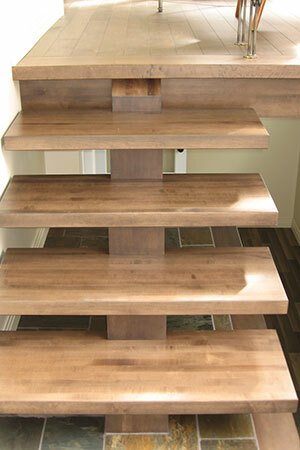 Use Ness’s StairFile or StairPlan service, it will save you hours of calculations and possibly expensive errors. If you don’t have a few good portable tools and some mastery of woodworking, either get someone else to help with the woodwork or subcontract it. It is a fantastic experience, that will make you use your muscles and your brain and give you a lot of satisfaction. 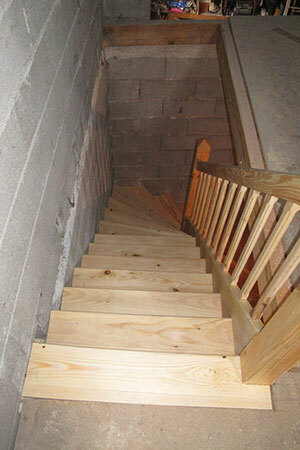 To conclude, thanks again to Ness, you can be proud of yourself to have enabled a complete beginner design and build a stair that’s a just a little complicated." "The logs came from an old barn that was dismantled and [the customer] reassembled into a nice little cabin on the river near Calabogie Ontario, Canada... thanks for the help and I look forward to working with you on our next project." 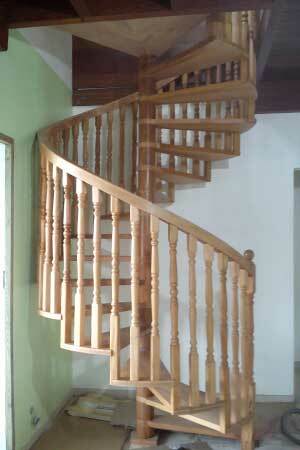 "Here I send you the design and the stair in reality. Here in Romania we have an average salary of 250-300 USD a month. Our costumer is very happy and proud because you offered us a free try and with that we could help those people." 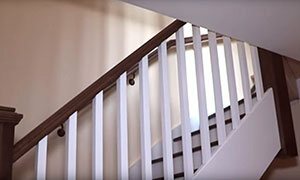 "Thanks to your advice I’ve just finished this stair with a central cut string using your laminated layer technique." 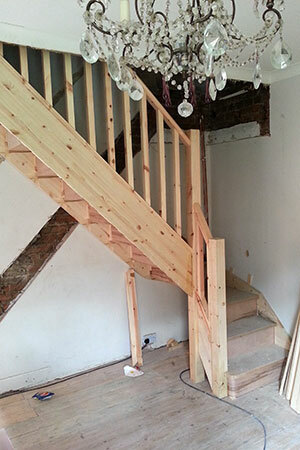 "Here are some photos of the stair I’ve made with temporary steps in place. A nice mix of steel and wood. Thanks to your site and software." 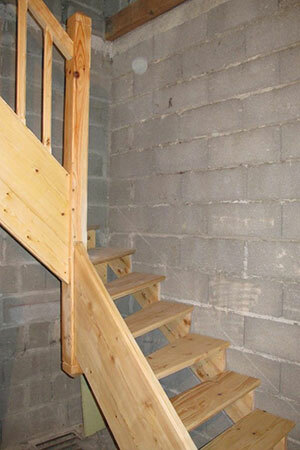 "I’m sending you some photos of the stair that I have built in chestnut, thanks to your stair software. I’m not a professional but an enthusiastic amateur woodworker." 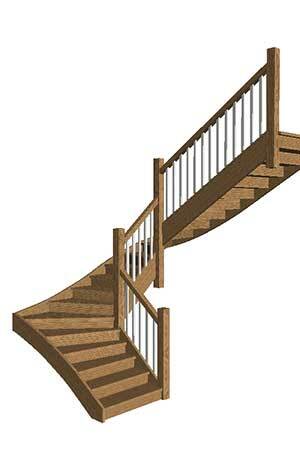 "I would like to share the experience that I had with your easy to use StairDesigner software. Not knowing wood I decided to work in metal, the wood I added later to give life to this staircase. Thank you for your site and support... it's cool." 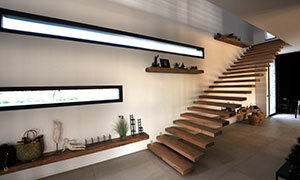 "The StairDesigner software is fabulous. I had a trawl through the web and this is the best app available." 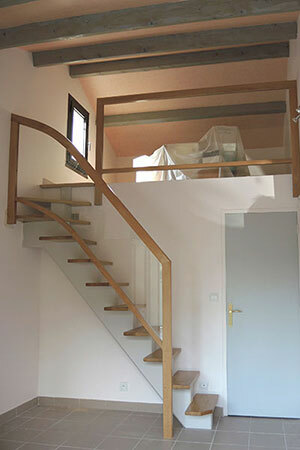 "Many thanks for the access to the StairDesigner software. Although I have used only the trial [free] mode, I was able to make the perfect stair dimensions for my house. The stairs were just installed!!! Once again, many thanks!!!" 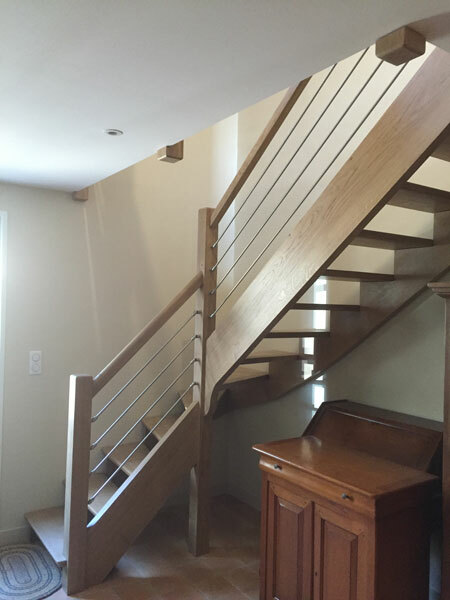 "Following our telephone conversation which brought me a great deal of satisfaction with your openness to share your knowledge, here are the photos of the stair... impatient to read more and to share know-how." 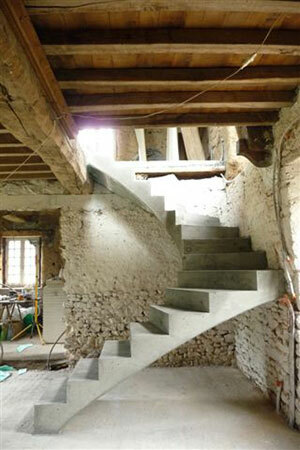 "The stair is a continuation on an existing stair and will end up in a newly decorated attic. Last step will be a landing that sits between two rafters. The project went well. 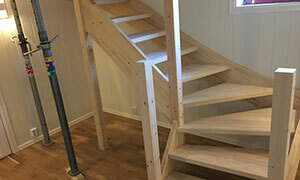 We are happy with the service and StairDesigner program." 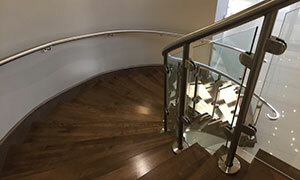 "The use of the StairDesigner software has allowed us to work faster and more reliably throughout the design and manufacturing of our stairs." "This was a very challenging project, but I am very satisfied with the result. I couldn't have done it without StairDesigner. All the wood used in the project is supplied from my own forest and processed home on the farm. 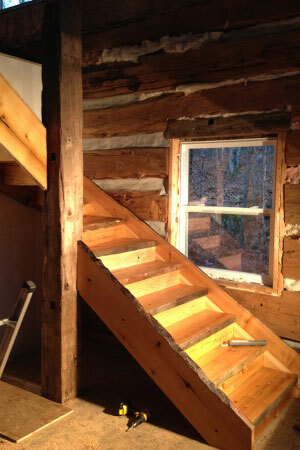 The stringboards and the newel posts are made from Pine. 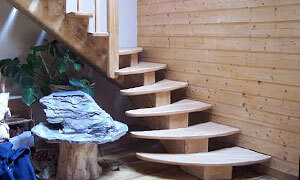 The steps are made from birch." 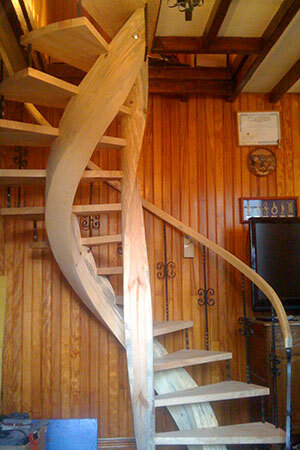 "Our company makes wood and steel staircases. 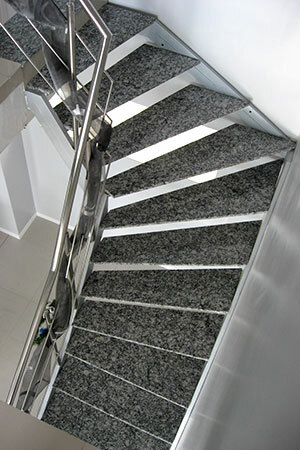 Using StairDesigner has allowed us to increase the speed and reliability of our staircase production process. We invested in a large format printer to print off the 1:1 plans, which allows us to trace the different parts of the staircase directly onto the material. StairDesigner is very easy to use. 3D rendering is also very useful for the client who is then able to visualise their project well. I also greatly appreciate the friendliness of the forum, the availability and the excellent advice from the team. It is important to have a space where you can share your know-how and passion for your job." I have made my stair thanks to your software. It’s a quarter turn with winders, difficult to calculate because of a very small stairwell that’s only 1750mm long... it all worked out fine in the end thanks to your software and help. Thank you for your kindness, for your advice throughout this year, and for all the tips you gave me about making a staircase, not simple at all for a novice like me. Thanks to you I achieved my goal.